With the BBC TV coverage coming to an end that's time for us to draw things to a close as well. Thanks for joining us and stay in touch with the latest cycling stories here. "Amazing job today. I crashed in the middle of the race but came back. "It was amazing how the team brought me back in the end. I spoke to them yesterday and told them I was in really good shape and we did it. "I hope we can follow this with more victories." 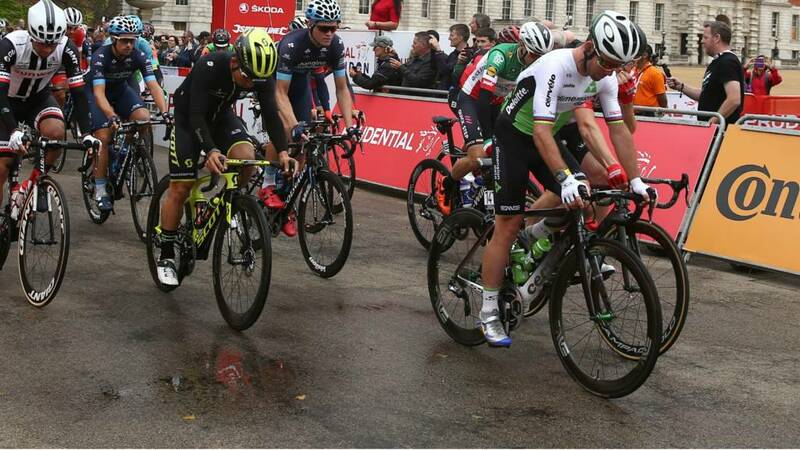 Looks like Mark Cavendish just struggled to get into position early enough there.That will disappoint the Manx rider. That was very well organised and a good job by Pascal Akerman. Elia Viviani made the mistake of going too early. Pascal Akermann just held his line and he wins with plenty to spare from Elia Viviani who drifted off left. Mark Cavendish finishes just outside the top ten. Elia Viviani has gone early but German champion Pascal Akermann has got him on the inside. Elia Viviani is looking good. Michael Matthews is in there as well. The peloton is really moving now. Here come the sprint trains. The Australian, Miles Scotson ekes out 20 metres or so and then is reeled in. Team Sky string out the peloton as BMC rider Miles Scotson attacks. That's the breakaway swallowed up by the main peloton. The final few km's are likely to crank up a little now. Quick-Step sprinter Elia Viviani is lurking right at the front of the peloton. Can't quite catch a glimpse of Britain's Mark Cavendish or German Andre Greipel though. Team Sky's Owain Doull looks spent after that last effort. But he's still holding on to Katusha Alpecin's Nathan Haas, with Christopher Jull-Jensen (Mitchelton-Scott) and Jay McCarthy (Bora-Hansgrohe) helping to maintain a 10 second lead over the peloton. Just a matter of time before they are caught surely. Just under 10km to go. Team Sky's Owain Doull sprints up the last leg-sapping climb in Wimbledon to take the final sprint. That's a little bit more pocket money for him before the peloton swallow up the remnants of the breakaway. The riders minds themselves, they keep looking back and know they haven't been caught yet. Certain riders will want to be out there and be the last man standing. When you're there and you've invested so much time and energy into it you want to see it through to the end. The breakaway group look drained. And there's still 20km to go. They are still maintaining their small advantage though. Only a 13 second gap from the peloton to the breakaway group now. Looks like the Quick-Step, Lotto Soudal and Dimension Data teams are up at the front of the peloton as they try to set things up for their sprinters Andre Greipel, Elia Viviani and Mark Cavendish. The peloton is playing a bit of a game, holding off as long as they can. But I think we might see some fireworks coming up, an attack. The breakaway are working well but you'd have to fancy the peloton, who look to be putting in a measured effort, to reel them in before long. Moreno Hofland, Bjorg Lambrecht and Adam Hansen are putting in a shift at the front of the peloton to enhance the chances of Lotto Soudal teammate Andre Greipel. The 36-year-old German sprinter has won 22 stages on Grand Tours and will fancy a sprint on the Mall. The gap is now 27 seconds.